Asking your SuperValu butcher to joint a whole chicken for you is a good trick for getting all the goodness of a roast chicken on a busy weeknight. 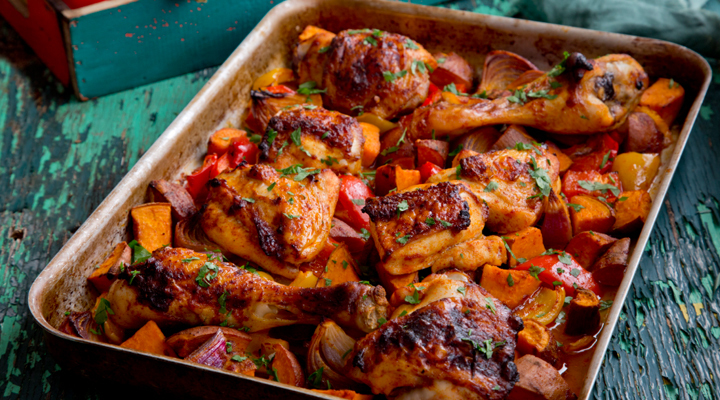 An added bonus of this recipe is that it's an all-in-one tray bake that will happily roast in the oven, leaving you to free to get on with other things while it cooks and very little washing up to do. Pour the maple syrup and oil into a jug and add the smoked paprika, salt and chilli powder. Whisk together until well combined. Place all the vegetables and chicken pieces in a large roasting tin in a single layer. Pour over the spiced oil, using a spatula to scrape out every last drop. Using your hands, toss the chicken and veg together to evenly coat them in the oil, then make sure all the chicken is skin side up. Grind over some black pepper and roast in the oven for 40 to 45 minutes, until all the chicken pieces are completely cooked through and the vegetables are tender and just starting to char. Transfer to a large serving platter and scatter over the chopped parsley. Bring straight to the table to let everyone help themselves to their favourite parts of the chicken. Cook this all the time when I need something hassle free. I boil a few potatoes to put with it on the side as a break from the sweetness.